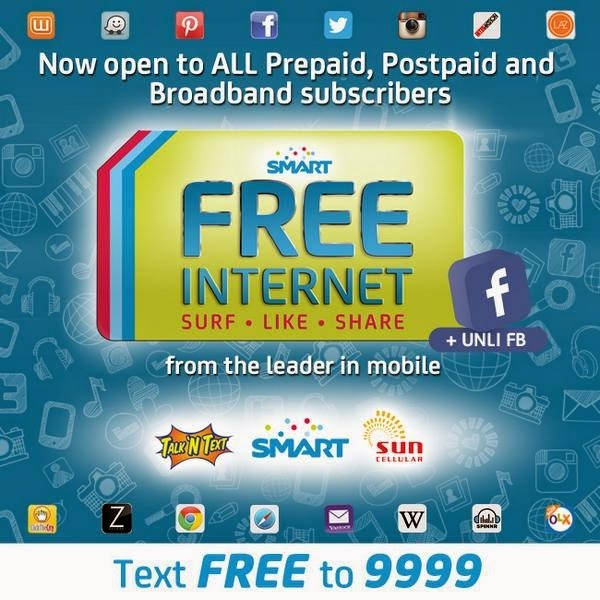 In another unprecedented move, Smart Communications, Inc. (Smart) and Sun Cellular announced that effective today, October 3, 2014, free Internet offer which is currently available to all of prepaid subscribers will also cover all postpaid and broadband subscribers of the country's biggest network. In addition, Smart, Talk 'N Text and Sun are extending the duration of the free mobile Internet promo across all subscribers – postpaid, prepaid and broadband -- from November 30 through the Christmas season until January 5, 2015. The announcement was made through MVP’s official Twitter on Friday. On top of their free Internet, all subscribers can also enjoy “unli” “all-you-can” Facebook access - including sending messages via Facebook messenger and viewing of videos embedded in the social networking site. Subscribers can also enjoy all-day Wikipedia access as well on top of their daily 30 MB free data allocation. Through this special offer, all of the 72 million subscribers of Smart, Sun and Talk ‘N Text can enjoy browsing through all their favorite websites as well their social media accounts using their data-enabled handsets. They can also send and receive emails, use their favorite mobile apps, shop online, and more – without incurring additional data charges. This move comes a week after Smart and Sun Cellular surprised the industry with its groundbreaking offer for free mobile Internet for its Smart prepaid, Talk ‘N Text and Sun Cellular prepaid mobile subscribers. "This is our way of thanking our subscribers as well as a response to the requests of our postpaid and broadband subscribers to be included in the special offer. It is part of our overall strategy in accelerating mobile Internet adoption and usage in the country," said Charles A. Lim, executive vice president and head for wireless consumer business at Smart. To avail of the free mobile Internet offer, subscribers just have to maintain an airtime balance of at least one peso, or be subscribed to any load bucket/promo. They can register each day, by simply sending “FREE” to the number “9999.” Registration is free. They will receive an SMS confirmation upon successful registration. Once registered, subscribers can enjoy a free data volume package of up to 30MB per day. Data charges will however apply to peer-to-peer uploads and downloads, videos (unless embedded in Facebook), VOIP and messaging (except for Facebook messenger). Smart’s successive free mobile Internet offers follows the leader’s recent announcement that it has stepped up the deployment of its broadband network, to meet the growing demand for data services.